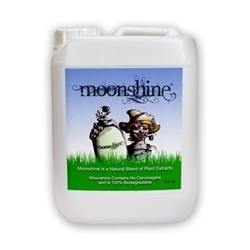 Moonshine® is a brewed plant bio stimulant that is designed to promote impressive plant growth, health and terpene production in a variety of ways. The first effect this illicit brew imparts is an increase in the cation-exchange capacity of your chosen growing medium. In increasing the amount of cations available to the plant at any given PH the fertility of the growing medium is increased, allowing nutrients and trace elements to be more readily absorbed through the roots. The second effect is to give the plant a good source of plant growth stimulators and amino acids. The growth stimulators include naturally occurring levels of auxin, gibberellin and Cytokinin plant hormones which are readily used by the plant to regulate plant growth, cell division in roots and shoots, bud growth and essential oil production. Finally the unique formulation promotes the transport of sugars through the plant to the places they are needed giving a noticeable increase in smell and taste.